Sums are replaced by alphabets. Same alphabets mean same number and different alphabets mean different numbers. Alphabets can be replaced to the number from 3 to 45. 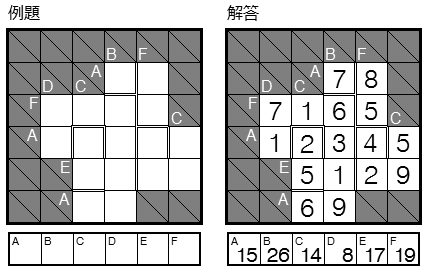 This is extended puzzle of Coded Kakuro. Really tough puzzle than usual Coded Kakuro. Such style Kakuro is first made by Kinpiragobou(*1)(*2) in 1996. In 2000s, Yukari Nishiyama started to make much of Coded Kakuro variation in her web site. She have developed this genre extremely. She made Coded Nonconsecutive Kakuro in 2003(*3). And this type first appeared in JPC 2006(*4). So far every puzzles in the genre uses Japanese letters because it requires at most 43 symbols. As a result it is difficult for foreigners to solve them. I constructed Coded Kakuro in smaller grid and limited alphabets this time. I tried to make easy puzzle. But it may not succeed though these puzzles are easier than usual. (*1) 金平牛蒡 : 地獄の覆面サムクロス, パズラー, 1996年8月号 (1996). (*3) 西山ゆかり : 覆面不連続サムクロス , パズルの館かものはし, 難問パズル, 第３回 (2003). (*4) 西山ゆかり : 覆面・連続サムクロス, 第15回全日本パズル選手権準決勝, PUZZLE 15 (2006). (*1) Kinpiragobou : Hellish Coded Kakuro, Puzzler, Aug 1996 (1996). (*2) Kinpiragobou is a Japanese puzzle maker. This is not real name but his pen name. This kakuro can be downloaded here. But unfortunately, it requires knowledge about Japanese letter to solve the puzzle. 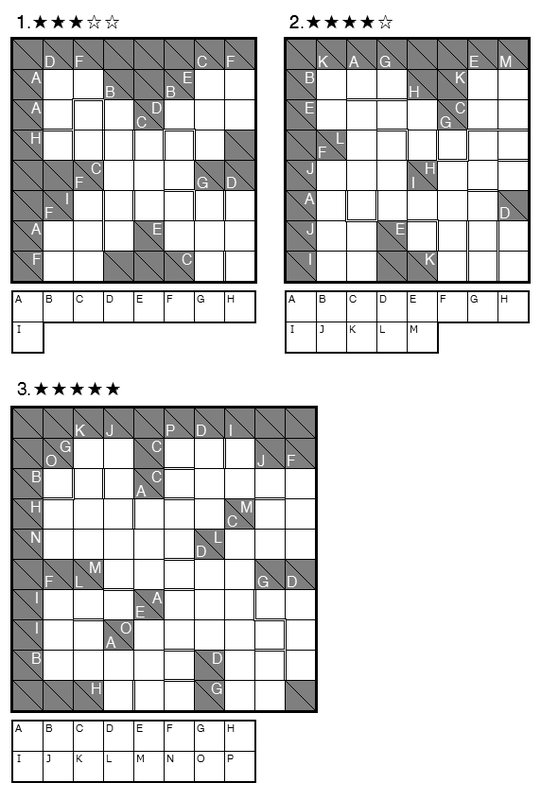 (*3) Yukari Nishiyama : Coded Nonconsecutive Kakuro, Puzzle no yakata Kamonohashi, Puzzle of the month, puzzle. 3 (2003). 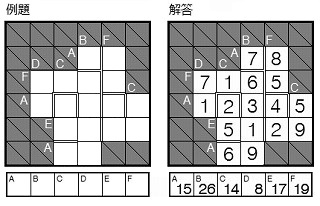 (*4) Yukari Nishiyama : Coded Consecutive Kakuro, 15th JPC semi-final, PUZZLE 15 (2006). (*5) Double line is popular "consecutive" sign in Japan.